February | 2008 | Save Griffintown! They would spend the money on, among other things, a “study of the suburbs to identify those that can be densified as new cities and those that can be returned to farmland.” They foresee a day when energy costs make long-distance food transport very costly, and more food will have to be locally grown. That day might come sooner rather than later — most oil geologists believe that the “peak” in peak oil is now; we’re now going down the jagged, uneven slope of depletion. By 2012-2019 (when the Devimco project is due to be finished) spot shortages — or longer outages — in the supply of fossil fuels will start to be commonplace. 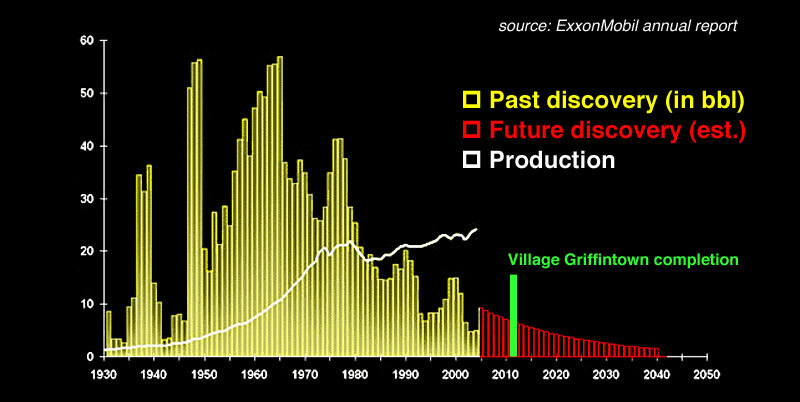 Consider this graph, “The Growing Gap,” which I adapted from a recent ExxonMobil annual report, comparing diminished future discovery with escalating demand (production). I placed the estimated completion date of Projet Griffintown on the timeline, for comparison. The ever-excellent Spacing Montreal posts another roundup of recent news articles and op-ed on Griffintown. La Presse’s Sara Champagne covers the tiff between Devimco and rival promoter Ronald Hakim, who wants to put in a pair of 60-storey (!) towers as part of his “medical tourism” complex. (Despite the probability that giant towers would trash the city’s own urbanism masterplan which dictate clear views between the Mountain and the river, one has to concede the point that other developers who had plans submitted according to the proper process are getting short shrift here.) Le Devoir’s Jeanne Corriveau also covers this story (registered users only). La Presse’s columnist Rima Elkouri goes for tea at Masala on Wellington with Dinu Bumbaru of Heritage Montreal, who discusses his organization’s “approval, with caveats” of redeveloping the Griffintown area; she notes how the proper review process has been “short-circuited” and how the political leadership has abdicated its responsibilities; in fact the city’s own urbanism department has been disbanded and it seems that private promoters are doing this work, obviously to their own benefit. The long-awaited first public consultation for Projet Griffintown begins tonight at 7pm, at L’École de technologie supérieure at the corner of Notre-Dame and Peel streets. Being present is a statement in itself — that you care about the future of Montréal. CSR Griffintown has posted some background material and documents that might interest you. Otherwise, you will also find links to news articles in our archives. Speaking of news: the free newspaper Métro in Montréal published an article on Griffintown just this Monday (Feb 18). I’ve tried in vain to hunt down an online archive. If you happen to find it, please leave us a comment. Thanks Patrick! Hope to see you at the ÉTS tonight. Purely because we’ve been covering the Griffintown project for so long now — since last September — this site has become a top hit for people searching for information on the project. It’s purely a personal blog, shared by two people with an abiding interest in urbanism. However, I hasten to add that whatever is published here, and the snark with which it is occasionally presented, is strictly ours and ours alone. Some of you who’ve been following the story, both here and via Spacing Montreal, have heard of this new Committee for the Sustainable Redevelopment of Griffintown. It’s an organization of Griffintown residents and people from neighboring boroughs who are pooling their expertise in order to make their voices heard, and to aim for a more positive outcome than the one planned by the City and Devimco. If you’d like more information on the Committee or to get involved, check out csrgriffintown.wordpress.com. You’ll see more “official” postings there about the group, activities, information, press releases, and so on. Full disclosure: I’m a member of CSR Griffintown, but Steph, my co-author, is not.